We are here to make sure you have a great experience browsing and buying artwork. Your feedback and questions are extremely valuable to us and we love to hear from you. What is Artspace Collector Guarantee? How do I search for artworks, artists, or Artspace partners? I forgot my Artspace password. How can I log in? How do I know when new items by artists I like become available? Can I change the currency setting on Artspace? Do I need to set up an account in order to make a purchase? What payment methods does Artspace accept? How is tax calculated on my purchase? Can I view the artwork in person prior to purchase? Do you offer a trade program? What is Collector’s Circle? How do I become a member? Who is eligible to use Affirm? What information does Affirm require? How do I sign up for Affirm? When will I receive my purchase? Does Affirm perform a credit check? Why was I prompted to pay a down payment with a debit card? Why was I prompted for a checking account? Do I need to sign for my package upon delivery? Do you offer expedited or same day delivery? How is shipping insurance calculated? Which countries does Artspace ship to? Can I combine multiple items into one shipment to lower shipping costs? What is an Artspace Auction? How does bidding work in Artspace Auctions? How do I know if I am the highest bidder at the end of an auction? How does shipping work for auction pieces? What framing options does Artspace offer? How can I best care for my artwork? Any tips for developing a great art collection? Do you accept artist submissions? What is a limited edition artwork? What is an Artspace Edition? Artspace partners with galleries, museums, non-profit organizations, and publishers from around the globe in order to provide our customers with access to the world’s best art and design items. Click the Partners link in the black navigation bar to browse all of our collaborators. The Artspace Collector Guarantee is our promise to our collectors to make purchases confidently. Click here to learn more. To search for a specific artist, artwork, gallery, or institution, enter your terms in the search box located at the top of the site and click the magnifying glass icon. To explore all available artworks and design items, click the Buy Art link in the grey navigation bar. On the Buy Art page you will be given the option to sort and filter results by price, medium, size, etc. To view all artists, click the Artists link in the grey navigation bar. Likewise, clicking the Partners link in the grey navigation bar will enable you to browse all of the institutions, galleries, and organizations that partner with Artspace. To reset your Artspace password, click the Sign In link located in the site header and then click “Forgot Your Password.” You will be prompted to enter your email address; after doing so, click “Submit.” You will be sent a temporary password via email, which you can use to sign in to the site. You can then visit the My Account page to officially change your password. All items are available for sale unless indicated as “Sold.” If you encounter a sold-out item and you wish to be notified if it becomes available, click the “Add to Wish List” link (in bold below the words “Sold”) and submit your contact information. Our team will contact you only if and when the item becomes available. You will receive email alerts when items by the artists you “follow” are added to the site. To follow an artist, visit the artist’s bio page and click the “Follow This Artist” link. Alternatively, when you log in to the Preference Center, you may search for and add artists to follow. This feature is also active for our Artspace partners, so you can follow your favorite galleries, institutions, and organizations as well. You must be signed in to your Artspace account in order to follow artists and partners. Wish List is a feature that allows you to save and organize your favorite artworks and design items in your own personalized galleries. You can then share your galleries with friends and family via email or social media. To add an artwork or object to your gallery from the item’s detail page, click the “Save to Wish List” button, which is located next to the item’s image. Alternatively, when you are not on a detail page, you can hover over the item’s thumbnail and click the “Save” button that appears in the lower right corner. You can visit and edit your galleries by clicking the “Wish List” link in the site header. You must be signed in to your account to add items to your gallery. You may view the entire Artspace site in U.S. dollars, British pounds, or Euros. To do so, click the currency drop-down menu located in the site header and select your preferred currency. Conversions are based on exchange rates and are updated daily; as a result, prices may fluctuate. Please note that all purchases are processed in U.S. dollars. Yes, in order to make a purchase you are required to set up an Artspace account with an email address and password. Through your Artspace account, you will be able to easily track the status of your order. Click here to set up your account now and get 10% off your next purchase. If you have not already created an account, you will be prompted to do so upon checkout. Artspace is a fully transactional ecommerce platform. Unless indicated as “Sold,” all items on the site are for sale and available to purchase directly through the site. To make a purchase, visit the detail page for the item you wish to buy and click “Add to Cart.” You can access Your Cart at any time by clicking the Cart page link, which is located in the site header. From the Cart page, you can continue the checkout process by selecting your preferred payment method (either credit card or PayPal). If you are not signed in to Artspace upon purchase, you will be prompted either to do so or to create an Artspace account if you are not already registered. Artspace’s online checkout system accepts credit cards including American Express, Visa, Mastercard, and Discover as well as PayPal. If you prefer to pay by wire transfer or check, please contact Collector Services. You can purchase an Artspace gift card by clicking the eGift Cards link located in the site header. Enter the gift card amount you wish to purchase as well as the recipient’s information and click “Add to Cart” to proceed to checkout. The recipient will receive the eGift Card by email immediately upon purchase. Note that discounts and promotions cannot be applied to the purchase of an eGift Card. You can redeem your Artspace eGift Card upon checkout. During the payment step of checkout, enter your gift card number in the designated section and the gift card amount will be subtracted from your total. Any remaining balance on your order can be paid either by credit card or by PayPal. All products that are Artspace Editions are identified on the product detail page. If for any reason you are not satisfied with your purchase of an Artspace Edition, you may return it within 30 days of receipt and receive a free replacement or a full refund for the price of the product. Shipping charges will not be refunded, and return shipment costs are the responsibility of the customer. Email returns@artspace.com with your order number and specific reason for the return. Artspace will get back to you with a Return Merchandise Authorization number (RMA#), and a prepaid return shipping label. The cost of the shipping label will be deducted for your refund amount. Please print out the below Return Authorization form, fill it out, including your RMA# and enclose in the return shipment of the artwork. Pack the artwork back in the original tube or box with the Return Authorization form as well as all of the packaging materials and certificate of authenticity that was included in the package. No return will be accepted without the proper paperwork and the works need to be returned in perfect condition in their original packaging to qualify for returns. We are unable to accept returns on those works of art purchased from one of our partner museums or cultural institutions. These works are all final sale items, and not available for return. All products not identified as Artspace edition and marked as returnable are not refundable. In the unfortunate event that your order arrives in less than satisfactory condition, simply take one digital photo of the item and one of the shipping container it arrived in, then attach the photos to an email and send to returns@artspace.com. An Artspace representative will get back to you in 2 business days on how to proceed with your order. For any additional issues, please contact customer service at service@artspace.com. All shipping costs and applicable taxes and duties will be added to your order upon checkout. These fees are dependent on your shipping address. Within the United States, sales tax will be added to orders shipping to New York only, per American online sales tax rules. For a shipping address outside of the United States, duties and taxes will be charged in adherence to the country’s current rates. To estimate duties and taxes on your order, add the item to your shopping cart and enter your shipping location on your Cart page. Our inventory is housed all over the world, so we are unable to accommodate viewing sessions prior to purchase. Please use our “Zoom” and “View in a Room” features for a more detailed look at an object. These tools are denoted on the item detail page by the magnifying glass and eye icons. You can also view an artwork directly in your home using the View in My Room feature on our mobile app. You can download our app in the app store. Artspace extends trade benefits to art advisors, interior designers, architects, builders, and developers through our Inspace Trade Program. To learn more or to enroll in the program, visit the Inspace Page or email inquiries to inspace@artspace.com. If applying for tax-free status, applicants will be required to provide proof of employment and a Tax ID number. Collector’s Circle is Artspace’s preferred client program offering advanced previews, access to the best art world events, logistical support for your Artspace purchases, and a full suite of resources providing the tools to assist you in every step of the collecting experience. Membership is automatic after your first purchase with Artspace. Artspace partnered with Affirm to bring you more purchasing power. Affirm is an easy and secure way of paying for your artwork over time while enjoying your purchase immediately. Choose to pay with Affirm over 3, 6, or 12 months with rates from 10-30% APR. Any United States resident or citizen 18 years or older with a Social Security Number is eligible to use Affirm. Your Affirm account is created using your name, email, mobile phone number, birthday, and the last 4 digits of your SSN. This combination helps Affirm verify and protect your identity. Select Affirm as your payment method while checking out. You will then be directed to Affirm's website to select your payment plan. Follow the easy sign up steps while you check out. You can pay your Affirm bills online at www.affirm.com/pay. They accept payment by debit card, bank transfer, and check. You don’t have to wait until your payments are complete to receive your purchase. Once your order is placed on Artspace.com, the work will be sent to you according to the shipping information listed on the product page. Yes. When you first create an Affirm account, Affirm performs a 'soft' credit check to help verify your identity and determine your eligibility for financing. This 'soft' credit check will not affect your credit score. Affirms tries hard to approve every purchase but sometimes can't approve the full amount. When this happens, Affirm provides a debit card down payment option so that you may still complete your purchase right away. Affirm sometimes needs more information about your financial situation to evaluate your loan application. They may ask you to link your online checking account, which helps determine your ability to repay a loan. If you are prompted to link your checking account and would like to continue with the application process, you may link your account by providing the login information for your online bank account. Affirm does not store your online banking login information - they simply pass your login credentials to your bank via a secure service linking your checking account. Linking your checking account DOES NOT authorize Affirm to debit your account. It only allows them to determine your ability to pay. For more information, contact Affirm at help@affirm.com or by calling 855-423-3729. Shipping costs are determined based on the price, dimensions, and weight of the item purchased, as well as by the item’s origin and the shipping destination. Shipping costs include all packaging, handling, and insurance fees. To estimate shipping costs on your order, add the desired item(s) to your shopping cart and enter your shipping location on your Cart page. When your order ships, you will receive a shipment confirmation email with a tracking number. You can check the status of your package and the estimated delivery date online by using the tracking number. Yes, all packages must be accepted and signed for upon delivery. Due to the valuable nature of artworks and design objects, Artspace packages should not be left unattended. We are unable to offer rush delivery at this time. Insurance is automatically included in shipping fees and covers door-to-door handling. If your country is not listed here, please contact service@artspace.com and our team will find a solution for you. All damaged items must be reported to Collector Services within 30 days of delivery. To file a damage report, send detailed photographs of the damage to service@artspace.com, along with your name, order number, and the item name. Collector Services will provide a return shipment label and will work with you to order a replacement. Multiple items shipping from the same location are combined to minimize shipping charges. However, items shipped from different locations cannot be combined. If you have a specific question about shipping multiple items, please contact Collector Services. Artspace Auctions are held to support our non-profit and institutional partners by expanding the potential of their fundraising benefits. In addition, Artspace organizes quarterly collector auctions that feature high quality artworks from our top clients. Most Artspace auctions last two weeks. To bid in an Artspace Auction, we recommend creating an Artspace account so that you can log in to your account and keep the same user information for every auction. We will ask for your credit card information only once for verification when you place your first bid in an auction. You can then bid on any artwork in an auction by entering either the next highest bidding increment or the maximum price you are willing to pay for that artwork. By entering a maximum bid, our system will automatically bid on your behalf up to that dollar amount based on the auction bidding increments. You will receive an email confirmation when you have placed a bid and will be notified via email if you are outbid. Some Artspace Auctions culminate in live auction events. If that is the case, your maximum bid will be transferred over to the live auction, and Artspace will either bid by proxy on your behalf or you may opt to continuing bidding online simultaneously with bidders in attendance at the event. The online auction end time will be clearly indicated below the bidding field. If you are the highest bidder on an artwork, you will be contacted via email within 48 hours of the auction’s conclusion. On top of the hammer price, the highest bidder is responsible for any shipping and handling costs as well as applicable taxes. Please see the Shipping Page for more information. All Artspace Editions are accompanied by a Certificate of Authenticity. We also stand by out Artspace Collector Guarantee. Artspace offers professional framing on most framable artworks. Framing options are indicated on these artworks’ detail pages. Please visit the Framing & Care page for more information. All our frames are manufactured in the USA, using eco-friendly & sustainably sourced engineered hardwood for durability and a uniform finish that is free of defects. Frames are available in Black or White Satin and Honey Pecan and they will arrive wired and ready to hang. All of our frames come with UV-blocking acrylic plexi to prevent color fading from exposure to light, keeping your art protected for years to come. We offer Plexi glazing on framed works, as it is now considered the industry standard for artists, museums and galleries throughout the world. Please care for your framed work with caution and only clean with a dry cloth on the moulding and soft cloth and Plexiglas cleaner on the face. For two-dimensional artworks, we recommend you frame your new purchase as soon as possible using UV-blocking Plexi or glass as well as conservation-grade mat and board. For advice on caring for three-dimensional artworks, please contact an Artspace Art Advisor by emailing service@artspace.com. Our Artspace Editors offer timely and informative article on collecting practices. To read about collecting trends, opportunities, and advice, please visit the Artspace Magazine. A particularly relevant article is How to Buy and Artwork You’ll Love on Artspace (or Anywhere Else, Really). Artspace Art Advisors are also available to help you find the right artworks for your collection. Please contact them by emailing service@artspace.com. No, we are unable to accept submissions at this time. Fine art editions offer an affordable and accessible way to build an art collection. Editioned artworks can vary in medium (from prints and sculptures to utilitarian objects, for example) and are produced at one time by the artist in a limited number. No additional artworks are ever produced beyond the determined edition number, which is why they remain valuable investment opportunities. An Artspace Edition is a limited edition artwork produced and/or sold exclusively by Artspace. 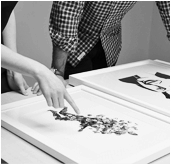 Our curators and production team members work closely with hand-picked artists to realize these editions. Artspace Editions are distinguished on the site by the Artspace Edition logo. Printmaking is an umbrella term for a variety of fine art techniques that involve producing an artwork in multiples. These include various methods developed throughout the course of art history—from traditions such as etching, woodcut printing, and lithography to more recent advances like digital printing—all of which are derived from the same concept: the artist transfers an image of his or her own design from a source (a metal, wood, or stone plate, for example) to paper, fabric, or the like. Prints are produced in finite editions; no additional artworks are ever produced beyond the determined edition number, which is why they remain valuable investment opportunities.